As the Los Angeles Rams prepare for their third season back in Southern California, the hype surrounding the team is as high as it’s been since the Greatest Show on Turf years in St. Louis. After a flurry of surprising moves, Los Angeles has quite a few new faces in the starting lineup, each of whom have spent their time as game-changing players at their respective positions over the past few seasons. There is an old saying that defense wins championships, and that seems to be a core belief of the Rams’ management considering the plethora of moves made to solidify the defense heading into 2018. To strengthen the secondary, the Rams traded for star cornerbacks Marcus Peters (2017 grade of 85.7) and Aqib Talib (86.2), signed free agent cornerback Sam Shields (82.8, 2015 grade) and extended the contract of Nickell Robey-Coleman (84.9). To bulk up the defensive line, the Rams signed the top available free agent defensive tackle in Ndamukong Suh (91.0), to pair with superstar interior defensive lineman Aaron Donald (99.7). Since the beginning of the 2014 season, the Rams’ cornerbacks have allowed a passer rating of 94.1 when targeted while averaging 9.0 cover snaps per reception. The foursome of Talib, Peters, Robey-Coleman and Shields, on the other hand, have allowed a passer rating of only 76.5 when targeted while averaging 11.3 cover snaps per reception. The Los Angeles cornerback group will enter 2018 as arguably the premier group in the league. Similarly, when comparing Donald and Suh to the rest of the interior defensive linemen in the NFL, a stark difference is obvious. Over the past four seasons, all NFL interior defensive linemen, excluding Donald and Suh, have accumulated a pass-rushing productivity (PRP) of 6.1 and a run-stop percentage of 7.2 percent. The combination of Donald and Suh have averaged a pass-rush productivity of 10.0 and a run-stop percentage of 9.0 percent. As if the additions to the defense above weren’t impressive enough, the Rams were also able to acquire one of the best deep threats at the wide receiver position in Brandin Cooks via a trade with the Patriots. Without skipping a beat, the Rams proceeded to extend Cooks with a massive five-year deal that will keep him in Los Angeles through the 2023 season. 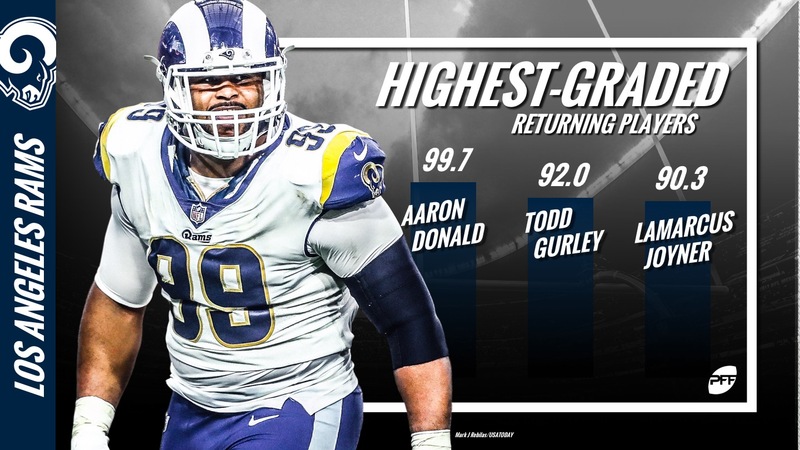 Between Cooks, who is just 24 years old, Todd Gurley (23) and Jared Goff (23), the Rams have not only one of the youngest offensive units in the NFL, but also one of the most promising. In 2017, Goff finished with a grade of 81.3, which ranked 15th out of 39 quarterbacks. Gurley led all 58 running backs with an elite grade of 92.0 and Cooks tied for 36th out of 116 wide receivers with a grade of 77.1. While Cooks’ overall grade was seemingly pedestrian, he excelled in deep passing category. Cooks was one of just four wide receivers with 30 or more deep passing targets (passes with targets of 20 or more yards downfield) to have a drop rate of 0.0 and with 608 yards on deep passes, Cooks was second to only Tyreek Hill of Kansas City. Overall, quarterbacks had a passer rating of 106.9 when targeting Cooks, a mark that was 14th highest among wide receivers with 40 or more targets. While Tom Brady threw more deep passes for New England last season than Goff did for the Rams, Goff had a higher passer rating (99.5 to Brady’s 88.5) and higher touchdown to interception ratio (4:1 to Brady’s 5:4) than Brady on such passes. With a significantly stronger running game in Los Angeles, Cooks is primed for a career year in 2018. As if bringing in all of the star players wasn’t enough, the Rams were able to add an additional 11 players in the 2018 NFL Draft. While a few of these players are sure to make an impact in the NFL, it must be noted that only one of these players were selected in the top 100 picks. Interestingly enough, the highest-graded draft pick for LA was their seventh-round pick, edge defender Justin Lawler, who had a grade of 89.5 in 2017. Lawler finished the season with 52 pressures, which was tied for 12th most among FBS edge defenders. The second-highest grade by a Rams draft pick was another edge defender, Ogbonnia Okoronkwo out of Oklahoma, who finished the season with a grade of 86.6. 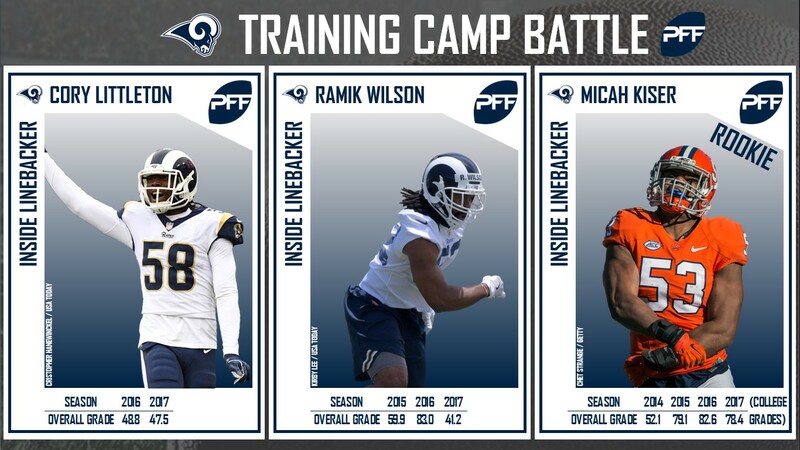 The young pair of talented edge rushers should complement Donald and Suh and the rest of the Rams defensive line, adding depth as they prepare for what can only be looked at as a hopeful lengthy playoff run in 2018. With all of the new additions to the Rams, Los Angeles is now one of the favorites to get to the Super Bowl from the NFC. This team is poised to not only find success in the 2018 season, rather, they are setting themselves up to be a dominant franchise for the foreseeable future.